Yamaha’s MODX is the less expensive, more portable version of their flagship Montage synth. It has the same exact synth engine as its bigger brother – but at a price which makes it a very interesting player in today’s synth market. There’s a lot going on in MODX – in this review and companion video I’ll look at the most important things you need to know to figure out if this synth is for you. Let’s get started by looking at some basic terms. A performance consists of everything you can do simultaneously with the MODX – the song I played in the intro to the companion video is all one performance: all the sounds you can make at a given time simultaneously – drums, piano, electric guitar and more, keyboard splits and layers, all the arpeggios, or beats or sequences, and automation/motion control for those sounds, all the scenes, which are different parameter states or stages of a song, all the effects you can apply to those sounds – all that is contained in one performance – and you can swap Performances in and out as you please of course. A performance can have up to 16 parts – and each part can use either the FM or sample engine. You can create music on MODX without drilling down into the parts and how the synth engines work, but you’d be missing out on a lot, so let’s dive in and take a quick look at them and then zoom back out. You can load up to 8 different samples, or Elements in MODX lingo, per part – and either layer them, split them across the keyboard, or have them play at different velocities or points at a note’s life cycle, for example, when you lift your finger off a note. Samples can be manipulated in ways you’d expect to see in typical synths, with filters, LFOs and envelopes which quick assign shortcuts to pitch, amplitude and filter cut-off parameters. Each Element comes with a dedicated multi-mode resonant filter with numerous slope options, including analog style filter emulations which sound quite nice. Each Element also have a dedicated simple LFO, with 3 shapes and direct access to modulating the Element’s Pitch, Filter and Amplitude, with very useful delay and fade in options. Finally, each sample or AWM2 Element comes with its own EQ options, including a 2 band and parametric EQ to boost or reduce specific frequencies. One layer above the eight-part elements are the Common Part controls. Numerous part settings include sends to the master reverb and one more configurable master effect, called the variable effect. You can also transpose all the elements of a part together which is great for creating layered chords. Aside from the master effect sends, each part gets two dedicated insert effects. You can take your pick from dozens of effects including reverbs, delays, distortions and many more. The effects sound excellent and having so many is in a synth at MODX’s price range is extremely rare. Part Common also contains arpeggio control, four lanes of motion sequencers, a more comprehensive part LFO with options beyond those in the Element LFO including the ability to draw your own LFO, and access to the Part’s Mod Matrix. The FM synthesis engine – called FM-X – is based on the capabilities of Yamaha’s classic DX7 synth, but enhanced with more operators, algorithms and oscillator shapes. In a nutshell, FM synthesis is kind of like the opposite of subtractive synthesis – rather than starting with a harmonically rich waveform like a sawtooth, or pulse, or a sample of a cello, and filtering it – you start out with a single frequency sine wave without any harmonics, and add harmonics and complexity to by rapidly modulating its frequency with another oscillator. Each FM part has eight of these oscillators connected to each other in one of 88 different layouts or algorithms. Don’t let the word algorithm scare you off though – it’s just a fancy word for different ways of placing oscillators in parallel or one before the other. The companion video explores these layouts further. The FM-X engine also has an interesting twist with non-sine waveforms. These have either all the harmonics, just the odd ones, with various skirt and resonance options. Skirt causes a sine wave oscillator to sound more like sawtooth, square or triangle oscillators. Zooming out of the Operator level, the FM-X engine’s Common page has additional functions very similar to the AWM2 sample engine, including a multimode filter, and pitch and filter envelopes, 2 configurable insert effects, arpeggio support, motion sequencers and a mod matrix, a multimode filter and two LFOs – a complex configurable one, and a simple second LFO for quick pitch, amplitude and filter modulations. Again, all this on the Part level. Aside from sample AWM parts and FM parts, there are two other part configuration options: one that supports General MIDI – which is a standard way of allocating samples so that MIDI files can sound more or less as intended on any device, and Drum kit parts, where each key can be assigned a different sample. You can create your own keyboard layouts assigning any sample you want to any key, or use the Rhythm Pattern button to audition a kit and immediately add it as a part in your Performance. Let’s take a close look at modulation. Many of MODX’s parameters, like a filter’s cutoff, the amount of distortion or sound’s pitch, can changed over time, or modulated in one of 3 different ways: (1) manually, via various physical controls like the assign knobs, assign buttons, the Super Knob, modwheel or external pedals; (2) using predefined patterns with using LFOs and envelopes, or the built in Motion Sequencers which we’ll talk about in a bit, or (3) dynamically using envelope followers or basically, audio levels of parts in your performance or an audio source coming in from the AD inputs. Any modulation outside the Element and Part envelopes and LFOs we discussed earlier, is done using the MODX’s Control Assign screens – which is this synth’s version of a mod matrix. A quick way to assign a modulation source to a parameter is using the Control Assign button. As you edit the various parameters of a preset you’re working on, if you see the Control Assign button light up, it means there’s a quick way to assign a source to it. To assign a physical controller to the parameter you chose – just touch it – you’ll immediately be taken to that controller’s slot in the mod matrix – or Control Assign page – and you can start changing the relationship between the controller’s motion and that parameter’s value. One of the first things you might want to change is the polarity – depending whether you want the parameter value to move in just one direction or both. You can also change and invert the movement ratio and slope type. A really interesting feature is the ability have completely non-linear curve types, and even define your own. This means that a sweep of a knob or motion sequencer doesn’t necessarily take you from value A to value B in straight line, but rather can take really interesting sweeps and swerves along the way. The Motion Sequencer is basically like an advanced configurable LFO. You can choose any number of steps between 1 and 16, each step can have one of two slope styles you can choose from, and a modulation depth that can be applied differently on a per step basis. Motion Sequences can either be looped or run once, and you can sync their timing to your performance as well. Each part can have four Motion Sequencing lanes and you can store a 8 different sequences for each one. Motion sequencers also have a global control switch so if you’ve got too much going on you can always turn them off. The Super Knob is MODX’s biggest glowing attraction, but there’s more to it than that. Aside from being assignable to individual parameters, the Super Knob can also control any one of the Assignable knobs – which in turn can control multiple parameters themselves. Another nice thing about the Super Knob is that you can tell its position with the ring of LEDs around it, something that the Assignable Encoders have on the Montage but don’t on MODX. And finally, once you have it set up to control any parameters you want, you can actually automate the Super Knobs motion itself as a modulation destination. One of the things that struck me as I opened the MODX’s manual was the claim that it had over 10,000 arpeggiators: up until that point I thought that 10 or 20 was a lot. But arpeggiators in MODX are quite unlike what you may be used to on other synths. Sure, it has the standard up-down arpeggiator you’re probably used to, but as you scroll through the list you can discover infinitely more interesting patterns. MODX’s arpeggiator is a cross between a sequencer and an AI musical robot. Each of the 10,000 arpeggiators are actually a pre-programmed sequence in one of multiple musical styles like Rock, Funk or Jazz, and they can be played in one of three ways. The simplest is just a plain old fixed sequence – many of the arpeggiators are drum sequences. With these, any key triggers the arpeggio and it doesn’t really matter what you press after that, the same notes (or drum samples in a drum kit) will play every time. Then there’s Original Notes type arpeggios, which will transpose the arpeggio pattern if you only press one note, and try and match any other notes you play. And then finally are what are called Normal arpeggios, which are anything but normal because they’ll take the programmed sequence and match it to the notes you play. So, for example, it will adapt a pre-programed sequencer to the appropriate notes whether you play a major, minor, or seventh chord. Aside from loading up one of the many built in arpeggio sequences, you can create your own by either importing MIDI files from a USB drive you can plug in the back, or you can play a pattern into the built-in song recorder, and then convert that into an arpeggio. When you start the conversion process you can determine which arpeggio type you want to create, including the smart “Normal” mode which adapts and changes your pattern based on the notes you actually play. 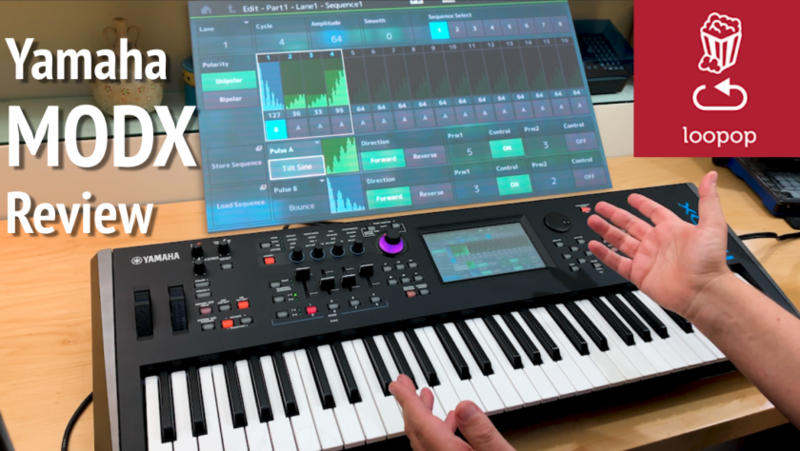 Unfortunately, there is no built-in step or piano roll style sequencer as of version 1.1 of the OS, so you either need to import MIDI files created in a DAW, or record your arpeggio live. Thankfully, a quantization option helps with getting the timing right. One of the greatest things about the arpeggiator in MODX is that you can run up to 8 different arpeggios simultaneously – one per part – which lets you create very interesting and complex compositions. Once you’ve got all your parts in place, you have a few facilities for mixing and layering parts. You access the mixer from the main performance screen, and it has a nice bird’s eye view of the effect sends, EQ options, mute and solo options, panning and level. When I first heard that MODX has 192 voice polyphony – 128 sample voices and 64 FM voices, I thought it was a bit over the top. But its multi part, multi-layer functions, along with how easy it is to just keep adding various layers and sequences means all those extra voices can actually come in quite handy. With thousands of presets, sample types, arpeggiators and drum patterns, it’s crucial to be able to find what you’re looking for quickly, and luckily there are pretty good facilities for that. Whenever you search for something, main and sub category filters help you narrow down your options. There’s an onboard Audition button which lets you quickly hear presets or arpeggios with quick, instrument-relevant sequences. Audition won’t just play though a preset: if there are a few optional sounds in it – the audition just might take you through them and any interesting Super Knob moves. As your song starts to come together, scenes are a great way to quickly swap synth states mid performance. Scenes can store multiple parameters including arpeggio types, Motion Sequencer patterns, and mute or solo states. MODX’s 7 inch screen is nicely viewable from multiple angles. You select on screen parameters either by touching the parameter or selecting it using arrow keys immediately to the right of the screen. You’ve got quick shortcuts on the right for various screens and access to Live Sets and storing performances, as well as a shortcut to part mute and solo management. The left side of the panel has four macro knobs which function either as programmable assign knobs, or can control one of 16 parameters labeled on the panel, and the faders control levels for either the parts or elements/operators, as well as Motion Sequence step levels when that screen is active. On the far left are level controls for volume, USB levels when you use the MODX as an Audio interface, and a few more additional assign and control buttons here, including a mod and pitch bend wheel. MODX can also be used as an audio interface with 10 mono or 5 stereo channels sent out and 4 mono / 2 stereo coming in. You can determine which of the channels you want each track to be sent to, so that they can then be recorded separately in your DAW. On the rear panel, MODX sports a USB jack for sending and receiving MIDI and audio to a computer, a slot for a USB drive, MIDI in and out ports, two foot switch and two expression pedal inputs, stereo speaker and headphone outs, and two audio inputs, which you can use to send audio to your computer for further effects processing, as a source for the envelope follower and tempo sync, or probably coolest of all, if you have a microphone around, you can use MODX as a Vocoder. On the Pros side – MODX is a great sounding, highly versatile synth, offered at a very competitive price. The Sample and FM sound engines are fantastic, and the amount and quality of effect won’t disappoint you. The modulation options are a sound designer’s dream and the ability to play multiple sequences, or arpeggios simultaneously means there are very few limits on what you can do. On the “cons” side, MODX is definitely not a “knob-per-function” synth; there’s quite a learning curve, which is to be expected with such a complex synth. Even if you know what you want to get to, it’s often quite a few clicks away. That said, with the number of parameters here, a knob per function approach just wouldn’t be practical. It’s obvious that the number of controls was reduced to help lower costs compared to the Montage – but where I think it’s felt most is with the reduced number of faders and assignable knobs – four more of each would have been very helpful. The touch screen interface is very readable but sometimes gets sluggish and is a bit of a downgrade if you compare it to today’s tablet and cellphone touchscreens. You do get used to it after a while, but it’s not as snappy and precise as cellphone screens. That said, there are phones that cost more than the MODX, so I guess it’s an acceptable compromise. The keybed is very good, but it does not have aftertouch. The mod matrix however does support aftertouch detection if you want to pair the MODX with such a keyboard. Finally, my one wish-list feature for the MODX is something that can be solved, hopefully, in a future update, which is the lack of an internal step or piano roll sequencer. As I mentioned earlier, the arpeggiator is really a sequencer, the problem is you need to play your sequence into a song using the MODX keyboard, and then convert the song to an arpeggio, or create a sequence with your DAW, put it on a USB drive, import it as a song and again convert to an arpeggio. If there was a way to shorten the number of steps in this process, or just add in a piano roll sequencer, it would reduce a lot of the friction currently involved in making sequences. Yamaha’s MODX is a sonic, sequencing and performance beast capable of creating pretty much any sonic soundscape you can imagine, whether playing with your hands, playing on its own, or any combination of the two. It’s a strong entry into the sub $1,500 synth marketplace, well worth taking a look at.